Exhaust camshaft alignment tool – No.0197-A1. Flywheel timing pin – No.0197-B. Inlet camshaft alignment tool – No.0197-A2. NOTE: Engine No. 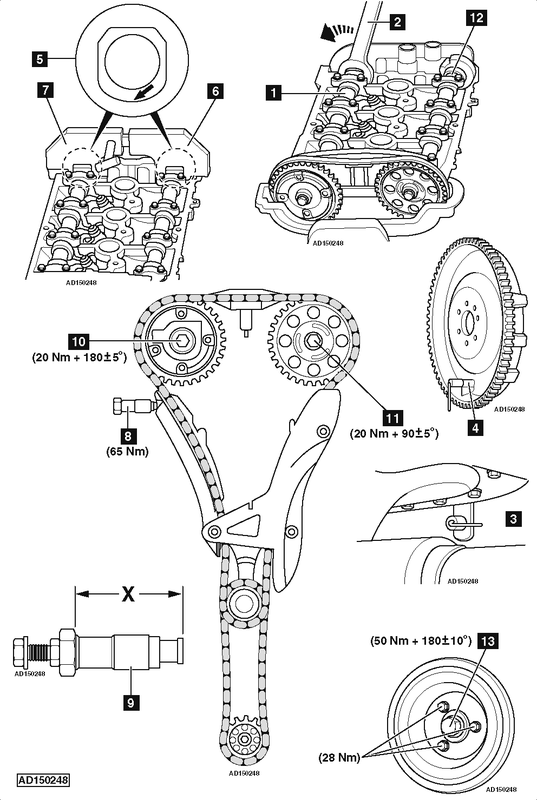 →42987: If timing chain tensioner part number is not V7 597 895 80, it must be replaced. Turn inlet camshaft slowly anti-clockwise as far as stop  . Camshaft rotation possible using spanner on hexagon  . Ensure inlet camshaft locked in position. Replace inlet camshaft adjuster, if not locked in installation position. Fit flywheel timing pin  . Turn crankshaft clockwise until flywheel timing pin engages  . NOTE: Ensure round section of alignment lobe is facing downwards  . Install exhaust camshaft alignment tool  . Install inlet camshaft alignment tool  . Remove timing chain tensioner  . Drill a 10,75 mm diameter hole into hexagon end of tensioner body. Insert M10 x 1,5 helicoil and fit M10 x 100 mm bolt with locknut. Install timing chain pre-tensioning tool  . Tighten adjusting screw until in contact with guide rail. DO NOT overtighten screw. Pre-load timing chain with pre-tensioning tool to 0,6 Nm. Remove camshaft alignment tools  &  . Remove flywheel timing pin  . Ensure inlet camshaft adjuster in the installation position. Ensure flywheel timing pin located correctly  . Timing correct when camshaft alignment tools abut cylinder head. Remove timing chain pre-tensioning tool  . NOTE: Replace chain, tensioner and guides if ‘X’ more than 68 mm. Refit timing chain pre-tensioning tool  . Remove central bolt from each camshaft  &  . NOTE: Camshaft rotation can be prevented using 27 mm spanner at positions shown  &  . Fit new bolts  &  . Finger tighten bolts. Remove crankshaft pulley centre bolt  . Fit new crankshaft pulley central bolt  . Finger tighten bolt. Install exhaust camshaft alignment tool  . If necessary, adjust position of exhaust camshaft. Install inlet camshaft alignment tool  . If necessary, adjust position of inlet camshaft. Ensure camshaft alignment tools abut cylinder head. Secure tools with bolts. Tighten crankshaft pulley central bolt  . Tightening torque: 50 Nm + 180±10°. Tighten inlet camshaft adjuster bolt  . Tightening torque: 20 Nm + 180±5°. Tighten exhaust camshaft sprocket bolt  . Tightening torque: 20 Nm + 90±5°. Fit new timing chain tensioner  . Tightening torque: 65 Nm.